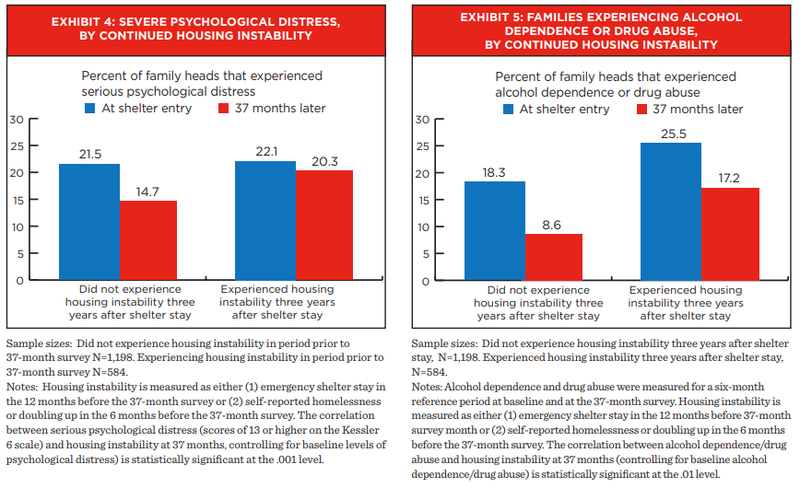 » Recent Highlights » How do Homelessness and Housing Stability Impact Behavioral Health? A new research brief published by the HHS’s Office of Planning, Research, and Evaluation (OPRE), Behavioral Health Improvements over Time among Adults in Families Experiencing Homelessness, examines the behavioral health of parents while they are in emergency shelter and over a three-year follow-up period. The brief, co-authored by Center experts Marybeth Shinn and Daniel Gubits with Lauren Dunton, uses data gathered through the HUD-sponsored Family Options Study, which collected a rich set of data on more than 2,000 families with children. Drug abuse decreased by more than three quarters, from 12 percent to 3 percent. Serious psychological distress decreased by nearly a quarter, from 22 percent to 17 percent. Alcohol dependence declined from 11 percent to 9 percent. Improvements in behavioral health were especially dramatic among parents who attained stable housing after exiting shelter, as indicated in Exhibits 4 and 5 from the research brief. As shown in Exhibit 4, households who did not experience housing instability reported a 31 percent decrease in serious psychological distress 37 months later. This reduction was much greater than that of households who returned to homelessness or doubled up (about 8 percent), suggesting that stable housing may be an important mental health intervention. Furthermore, parents who experienced psychological distress while in shelter were no less likely to achieve stable housing over time. The relationship between substance abuse and housing stability is more complex, as families who report substance abuse when they entered shelters were also less likely to be stably housed 37 months later (Exhibit 5). Read the full brief on the OPRE website to learn more.